There’s a cute little cafe called New Boston Bakery in nearby Fall River that serves a creative offering of sandwiches, paninis, and wraps weekdays for lunch. Just 10 minutes away from my office, it’s a common lunch destination for my colleagues and me on those beautiful summer days when we’re all dying to get away from our air-conditioned offices to take in the warmth of the sunshine. New Boston Bakery has so many yummy offerings, but my favorite is their Vegetarian Wrap with Roasted Red Pepper Hummus. to make, but if there’s one thing that has kept me from making my own in the past it’s the tahini. Tahini is a paste similar in texture to peanut butter, but instead of being made from peanuts, it’s made of roasted sesame seeds. Although it’s traditionally an essential ingredient in hummus, it’s quite high in calories and not typically a staple item in my kitchen. For my easy homemade hummus, I substitute the tahini with a tablespoon of toasted sesame oil which I always have on hand for a finishing touch to Asian inspired stir fries. The toasted sesame oil gives the hummus great sesame flavor, and using it instead of the tahini saves quite a few calories as a small amount imparts huge flavor. If some of your family members are not concerned with calories, serve all the same ingredients below in a whole-wheat wrap or pita bread with a sprinkle of crumbled feta or goat cheese. In a small bowl soak the red onion strips in ice water for at least 10 minutes. This will remove some of the harsh flavor from the onions. After the onions have soaked, drain and pat them dry with paper towel. HUMMUS: In a food processor puree the chickpeas, garlic, lemon zest and juice, toasted sesame oil, 1 teaspoon of coarse sea salt and ½ teaspoon of black pepper until smooth (just a friendly warning that if you are using table salt instead of course salt you will want to use much less than 1 teaspoon). Taste the hummus and season with additional salt and pepper if necessary. 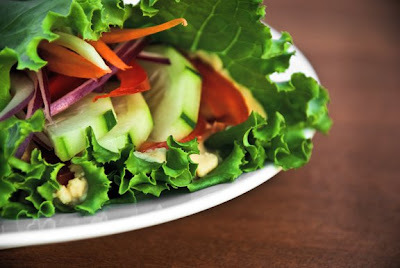 To assemble the wraps: Spread a whole lettuce leaf with a couple tablespoons of hummus. Top with a small amount of each of the remaining vegetables, roll and enjoy. This looks so delicious. Truly a picture of summer with all of these fresh vegetables. You know it is one of my favorites at NBB so I can only imagine what yours tastes like. As always I love your writing and love how you mention local restaurants, farm stands, etc. Sounds great! Can't wait to try it. I love toasted sesame oil, just used it last week for the first time. Thanks for teaching me all about it! Awesome. I tried making my own hummus before but it was kind of dry. Maybe the sesame oil would help with that. And nice tip on soaking the red onion in ice water! I love it.